The Chesapeake Bay Preservation Ordinance was adopted to protect our local streams and the Chesapeake Bay from pollution due to land use and development. All of Arlington County’s water drains into the Potomac River and ultimately the Chesapeake Bay. 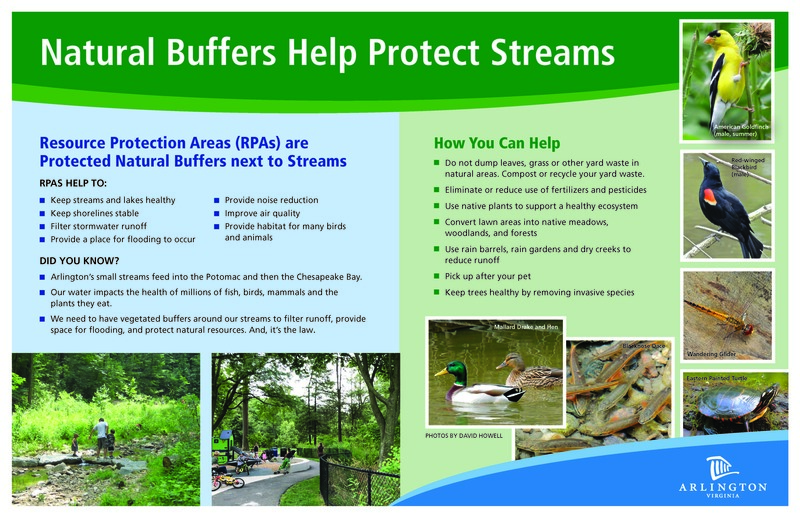 In an effort to protect and improve the quality of these waterways, sensitive areas along streams throughout Arlington have been designated as Resource Protection Areas. 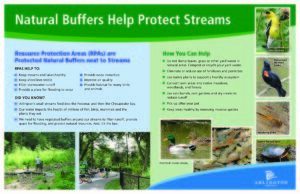 A fully vegetated stream buffer can help protect private property by preventing erosion along a water body. Steep slopes (25 percent or greater) that are adjacent to buffers are also part of the RPA because of the potential for erosion in these areas. How do I know if there is RPA on my property? RPAs include any area within 100 feet of a stream. Check the RPA maps below to find out if there is RPA on your property. You can also call Arlington County Department of Environmental Services (703-228-4488). What types of things can I do in the RPA? Gardening – Typical gardening activities are allowed, unless you are digging and exposing the soil of an area great than 50 feet by 50 feet (2500 square feet) or removing mature trees with a diameter of 3 inches or greater. The removal of mature trees with a diameter of 3 inches or greater. Minor trimming and clearing of vegetation for sight lines and vistas is allowed. However, if such activities involve removal of trees, first contact DES at 703-228-4488 to determine if the proposed tree removal is permitted. Read some Frequently Asked Questions about activities in the RPA. What Activities Require Approval in the RPA? Except for the minor activities described in the previous section, most activities in the RPA require some level of County review and approval. In general, development is allowed in an RPA as long as the overall developed area does not increase or extend further into the RPA. Activities such as replacing an existing deck in the RPA or installing a new fence in the RPA, although considered allowable, must be approved by the County. Creating a new structure or paved area in the RPA, such as building a retaining wall, an addition to your home, or a new home, generally will require an exception request reviewed by the Chesapeake Bay Ordinance Review Committee. In all cases, the County will review the proposed RPA activity to ensure that water quality is protected. The removal of mature trees with a diameter of 3 inches or greater requires County review and approval. The Chesapeake Bay Preservation Area (CBPA) map is a component of the County’s Chesapeake Bay Preservation Ordinance (Chapter 61) and is required by the Virginia Chesapeake Bay Preservation Act (1988) and Chesapeake Bay Preservation Area Designation and Management Regulations. The purpose of both the regulations is to improve the health of local streams, the Potomac River, and the Chesapeake Bay. The CBPA map shows all lands identified as RPAs by the County Board and is more often referred to as the RPA map. The map was last updated in 2017. RPAs are the most sensitive lands adjacent to streams where water quality is more likely to be negatively impacted during development. RPAs in Arlington also include “such other lands considered by the County Board…to be necessary to protect the quality of State waters.” Under the “other lands” provision, the ordinance designates as RPA all natural and man-made stream channels mapped in the County’s GIS system, whether perennial or intermittent, along with a 100 foot buffer along both sides of such channels and any adjacent 25 percent or greater slopes. What is Land Disturbing Activity?